We are so happy for our friendly boy who went to his new home in the Fall of 2018! Tank is a registered 17-year-old Arabian gelding who found his special person at CCHR. Tank came to CCHR without ever having had much handling but he did wonderfully with his rehabilitation including his groundwork and under saddle work. He has found a wonderful companion in his adopter and is living happily in Ojai! June 9, 2018, was our favorite kind of day at CCHR...going home day for one of our wonderful horses! 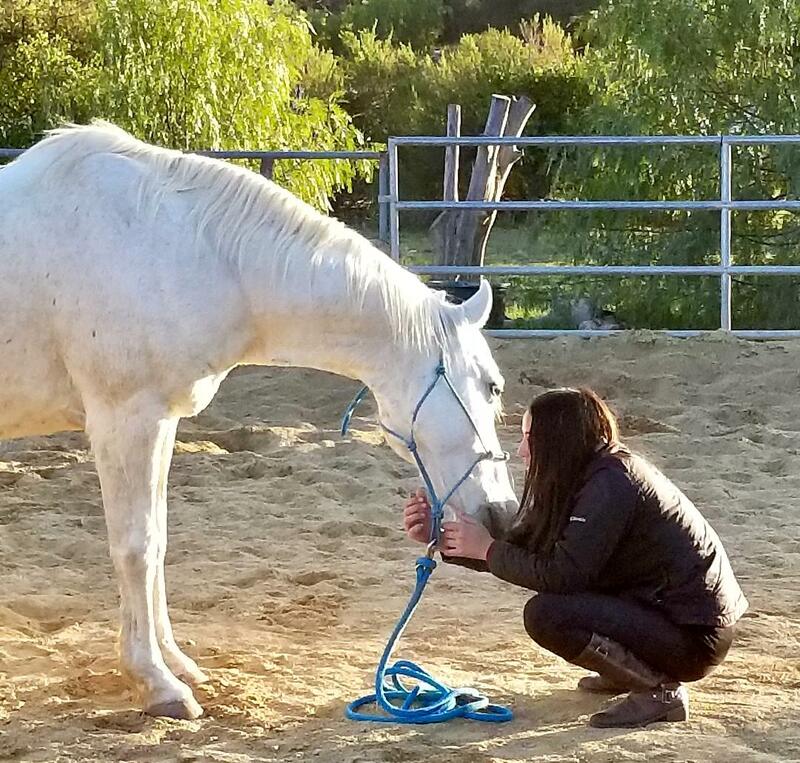 Toby literally rode off the CCHR ranch with his adoptive mom and went to his wonderful new home! This sight of this sweet 18-year-old Quarter Horse setting off with his new mom was such a happy and very moving sight. Toby and Alexis are a wonderful team and we are so happy that these two found each other and immediately bonded. ​Many happy trails for them both! 1. (of an individual or their tendencies) not able to be corrected, improved, or reformed. Incorrigible is what they had labeled Johnny in his past. A "funny" pony with a terrible mean streak a mile wide who was impossible to ride safely. The reality? A sensitive and fearful little guy who was looking for security and reassurance at every turn. And today? After a lengthy rehabilitation at CCHR, a well-adjusted gelding (with a mischievous streak a mile wide!) who went to his new forever home in May of 2016!! Johnny and his new mom met when she became a volunteer at CCHR. Over the course of many months, they started to learn about each other and a bond soon formed. Kathy and Johnny worked on their new relationship, and as they spent more time together, you could see Johnny opening up to her. He showed this in a variety of ways including the excited noises he would make when he heard or saw Kathy and the sense of pride he seemed to show whenever she worked with or rode him. All of us at the rescue had a wonderful opportunity to witness their relationship blossom. They now spend several days a week out riding the trails and enjoying each other's company. We could not have imagined a happier life for this spirited pony! Prinz, a 13-year-old Hanoverian, came to CCHR in June of 2015. His family needed to place him and, putting his needs first, they decided to donate him to the Rescue. 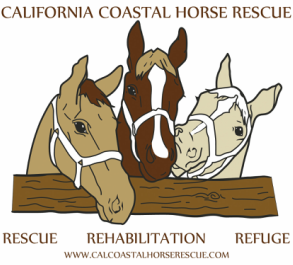 Most of the horses that find their way to CCHR are badly in need of physical and/or emotional rehab, but not Prinz. His family had cherished him – and it showed. He was in great condition and well trained. The volunteers adored him and the other horses welcomed him to the herd quickly.Given all his wonderful attributes, we knew he’d find his new person quickly – and he has. He’d only been at the Rescue a week or so when a woman named Kathy heard about him. She came up with her young daughter and mother. It was love at first sight. Prinz took to all three generations quickly, but he showed a special interest in Kathy’s daughter, and she in him. Following CCHR protocol, Kathy and her family visited Prinz regularly for the next couple of months and, along with our trainers, she started to work with him. The bond between them deepened. At the beginning of October, Prinz got his official new beginning with his new family. Although the volunteers will miss Prinz, this is a wonderful success story, with several pieces fitting together at just the right time. 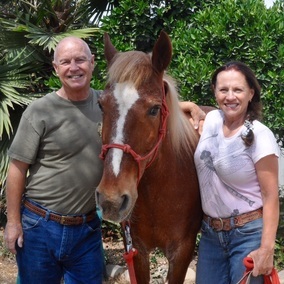 We wish every horse could find his or her new person as quickly and easily as Prinz and Kathy found each other. Luckily for Kathy, she didn’t have to kiss many frogs before she found her Prinz. his handsome bay and black gelding had been abandoned and brought into the Camarillo Animal Shelter (where he quickly became a favorite of everyone at the shelter!). Very sweet and calm, this 15 year old waited several weeks for his new family to come along. His new family fell in love with him right away and over the course of several visits, Luke (now named Hoss), got to know his potential new family. We very happily saw that they bonded right away. After a CCHR pre-adoption check of his new home, Hoss' family brought him to his new place at the beginning of September 2014. After enjoying a lovely bath, Hoss proceeded to make himself right at home as he went for a roll in his new pasture. He settled in right away! Hoss now enjoys the company of several horses and has been going out regularly on some great trail riding adventures with his family. Cap is a 17 year old, 15.3 hand Thoroughbred gelding who lived with us at CCHR on and off for about 2 years. He is a big, absolutely beautiful and charming boy! As a younger horse he did race but was retired due to a fracture in one foot. He made a full recovery and was successfully adopted out and became a trail horse. He was later returned to CCHR due to economic reasons. ​Cap spent a long time looking for his new perfect person and we are happy to say he found her! Over a several month-long process, he and his new person formed a wonderful bond as they spent time working together and just being with each other. They started the next part of their journey at the end of July 2014 when Cap was adopted and welcomed into his new home. Cap now enjoys a lovely home, someone who is absolutely devoted to him and going out on some great trail rides. Some twenty years ago there was a little girl who fell in love with a beautiful white horse who belonged to a neighbor. Sadly, the horse was sold and moved away but the girl always remembered her. Several years later the now young woman began to search for the horse she had loved as a child. We are happy to say that the beautiful horse and the young woman who never gave up hope of finding her were reunited at CCHR. In April 2013, Saahala left for her new forever home with the 'little girl' who never forgot her and whose perseverance made this incredible reunion possible. J.J. is a 12 year old chestnut 15.3 hand Thoroughbred gelding. He received training as a hunter/jumper and enjoys this but cannot compete due to an old tendon injury. This injury doesn’t bother him and he is sound and healthy. J.J. is a sensitive and willing horse with an extraordinarily sweet nature. He received some training at CCHR using natural horsemanship methods and we always knew he would be a good match for a confident rider willing to take the time to create a partnership with this special boy. J.J. found his special person and left for his new forever home in July of 2013. ﻿Once upon a time there was a horse named Durango. This hard working trail horse, while not the most handsome boy on the saddle string, had a heart of gold. After his retirement he came to live at CCHR waiting for his chance at a new life. Durango is gentle and shy and tended to be overlooked among the other flashier pushier equines. Then, along came a relatively new CCHR volunteer who saw the beauty of this sweet soul. 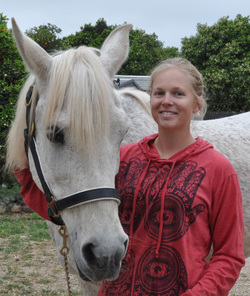 She educated herself on the tenets of natural horsemanship and began spending time working with Durango. Under her tutelage Durango blossomed; we witnessed his new confidence, the sparkle in his eye, the spring in his step, his quirky sense of humor. His human companion also blossomed as she realized how much she cared for this horse. Soon, Durango became a family affair with husband and daughter now joining in this four legged make-over. In February of 2012, this family knew that he absolutely belonged with them and he officially became the newest member of their family.